On your second visit to our office, you will be greeted at the front desk by Nicole and asked to sign in. 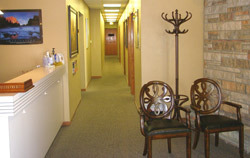 You will then be led back to Dr. Hausch’s office to review your examination and x-ray findings with the doctor. Dr. Hausch will answer all your questions and provide you with a written explanation of what he found during his examination, if chiropractic care is a good option for you, what is recommended for treatment and what the cost will be. We explain everything first. If you choose to proceed with treatment at that time, you will be escorted to the treatment room and you will receive a chiropractic adjustment. Following the adjustment you may receive therapy, but that depends on the doctors findings and recommendations. Therapy can include massage, electric muscle stimulation, hot packs, cold packs or ultrasound. Recommended therapies are based on your specific condition and diagnosis. Following treatment you will see Nicole at the front desk to schedule any future appointments. Learn what you can expect on a regular visit to our Mt. Greenwood chiropractic office.